Most experts agree: the future is here, but how do we make it go? The quest for fuel is one of the central problems of our era, and as we scramble for solar cells and try to turn algae into gasoline, we can't help but wonder why people didn't bother to work this out decades ago. Well, while most of the world was content to drill for oil and forget about tomorrow, there were some rudimentary efforts towards alternative power sources. But sometimes the best of intentions can't make up for dismally bad ideas. Imagine a miniature nuclear reactor colliding with a guard-rail at fifty miles-per-hour. Now you understand the major flaw of the Ford Nucleon. 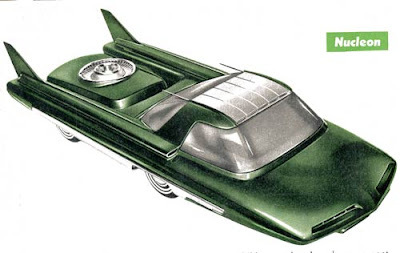 Resembling a hybrid between a speed-boat and George Jetson's flying saucer, the Nucleon was a design concept unveiled by the Ford Motor Company in 1958. Atomania was huge, and the Nucleon was intended to be the world's fist atomic car. While the specifics of the Nucleon engine had not been finalized, the idea was that the Nucleon would have hot hunk of uranium in the back, boiling water into steam which would then drive the engine. While the water tank would need to be regularly replenished, the radioactive fuel could last up to five thousand miles before being replaced. The Nucleon was also designed to have multiple engine settings (depending on the owner's driving habits) to ensure optimum fuel efficiency. All that and no harmful carbon monoxide fumes. What a deal. Given the problems that we've had with stationary nuclear reactors (staffed with ostensibly well-trained employees) the notion of clueless drivers speeding around with a engine full of uranium is more than a little horrifying. Engine tune-ups would necessitate hazmat suits and the highway exits would be littered with depressing sales stations dealing in fuel-rods and blue raspberry slushies. Thankfully, the Nucleon never made it out of the design stage. There's one less thing to worry about. I believe there is some dispute among knowledgeable experts about when the future will actually arrive. There is however a general consensus it will arrive in due time. Sooner or more likely later. Y'know Kevin, you're probably a computer program based out of China, but you sound like a man who likes smoking. Dangerous habit, sure, but hey, I like your style. I picture you extolling the virtues of Newports on stage down at the jazz club, maybe pausing to stroke your goatee and adjust your slick sunglasses. You're Beat through and through, Kevin. You're just incomprehensible enough to make perfect sense. I can dig it.